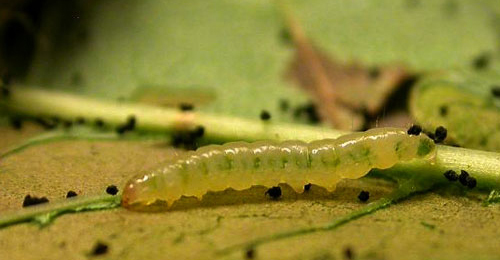 Leaf-miner: Larva solitary in an elongate upper-surface epidermal (thence silvery) mine. Frass initially in a rust-coloured central line. Later, when the mine starts to contract and the leaf folds over the mine, the frass is black and concentrated in a corner of the mine. At this point the larva leaves the mine, and starts living freely in a downwards rolled leaflet (Bladmineerders van Europa). The mine can be distinguished from that of G.syringella on the same plant as it is a silver colour whereas that of G.syringella is brownish (British leafminers). Emmet, Watkins and Wilson (1985a) write that the larva has a black spot laterally on head and prothorax; that does not match with the photo above (Bladmineerders van Europa). Time of year - larvae: July-September (British leafminers). Distribution in Great Britain and Ireland: Britain & Ireland (Karsholt and van Nieukerken in Fauna Europaea) including Denbighshire, Derbyshire, Dorset, Durham, East Cornwall, East Kent, East Ross, Glamorgan, Hertfordshire, North Somerset, Shropshire, South Northumberland, Stafford, West Cornwall, West Gloucestershire, West Norfolk and Westmorland (NBN Atlas). See also British leafminers distribution map. Distribution elsewhere: Widespread in continental Europe including Albania, Austria, Belgium, Czech Republic, Danish mainland, Estonia, Finland, French mainland, Germany, Hungary, Italian mainland, Latvia, Norwegian mainland, Poland, Romania, Russia - Central, Northwest and South, Sardinia, Slovakia, Sweden, Switzerland, The Netherlands, Ukraine and Yugoslavia (Karsholt and van Nieukerken in Fauna Europaea).